Our past events have been so fabulous we want you to read all about them! 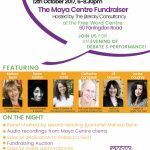 If your company would like to hold a fundraising event for the Maya Centre please get in touch. We'd love to hear about how you can help us fundraise to support more vulnerable women in our community with our specialist counselling service. The theme of our client summer open day was women’s mental health, combining psychoeducation, group discussion and self- care activities. The key focus centred on perceptions and understanding of mental health. 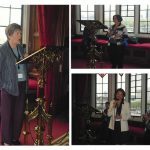 The Maya Centre hosted a sparkling reception in The River Room at the House of Lords on Monday May 9th 2016, providing the centre with a chance to showcase and celebrate its work with friends and funders. 09 June 2015, London: Global cosmetics retailer LUSH has agreed to help support the Maya Centre with a series of Charity Pot Parties across seven stores from on Saturday 13th June. We celebrated our 30th Anniversary on World Mental Health Day, Friday 10th October 2014 with an inspiring evening of energy, emotion, entertainment and thought, culminating in a renewed determination to support women to overcome the impact of abuse, for as long as it takes.